So far, we’ve raised nearly £43,000 towards a new Observatory in Williamson’s Park, Lancaster. We are hopeful that the proceeds from selling Eclipse Glasses for the American eclipse this August will take us over £50,000. 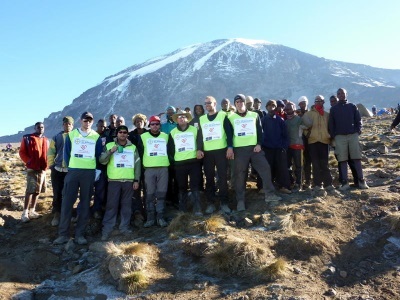 In 2010 George’s dad Jonathan climbed Mt Kilimanjaro with five friends to raise £26,000 for North West Air Ambulance, who had rushed his son George to hospital. Following a six-day hike through Tanzania, Jonathan tackled the climb with his friends Paul Pickavant, Gareth Crossley, Phil Passmore, Shaun Tomlinson and Scott Brockbank. Fighting against altitude sickness and helping one of his friends back down when he struggled with oxygen deprivation, Jonathan completed the ascent in seven days and was overwhelmed to reach the summit – and later felt even prouder that, together, they’d raised enough money to equip two North West Air Ambulances with state-of-the-art defibrillators that would save lives. As well as donating five telescopes to St Helens in Overton, George’s primary school, we’ve also been able to provide over 28,000 pairs of eclipse safety glasses to 75 local schools in the North West for the solar eclipse on 20th March 2015. George would have been crazy about the eclipse, which is why we believe that as many children and teachers as possible should be able to enjoy once-in-a-lifetime events like this safely and share in his great passion. Together we’ve also raised £12,000 for George’s Telescope Appeal so far; a total that we couldn’t have reached without the time, energy and rock-solid commitment of Laura McConville’s annual Force 5 challenges at Lancaster University Sports Centre – and everyone who takes part. 2015’s Force 5 challenge saw 17 super-fit locals tackle five solid hours of intense exercise, including an Insanity workout and a kettlebell session. Together they raised over £2,000 to add to the appeal in 2015, and we’d like to spread the word to make every Force5 even bigger than the last. As ever, our huge thanks to everyone who’s taken part over the years and helped to get us even closer to our goal. There’s no need to pull on your hiking boots or gym trainers to raise money for George’s Telescope though – if you’d like to, you can donate here. 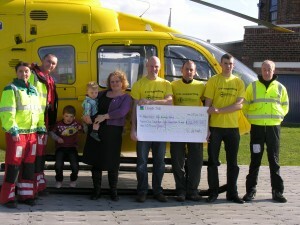 We’re hugely grateful to everyone who donates, and every penny really does count. And one day, when you’re taking a walk through Williamson Park, you’ll be able to look up at George’s Telescope and think about the next little Galileo or Brian Cox who calls it their favourite place in the world – and you’ll know that you helped make it possible. Please visit again for more astronomical news and fund raising events – and we’re always open to new ideas if you’d like to get in touch.